Gen. Jonathan Vance wants to send a message of solidarity — and spark a rush for the military's recruiting centres — this weekend by becoming the first chief of defence staff to march in a Pride parade in Ottawa. Gen. Jonathan Vance wants to send a message of solidarity — and spark a rush for the military's recruiting centres — this weekend by becoming the first chief of defence staff to march in a Pride parade. Canada's top general will lead a contingent that includes many of the military's most senior leadership through the streets of Ottawa during the city's annual Capital Pride Parade on Sunday. 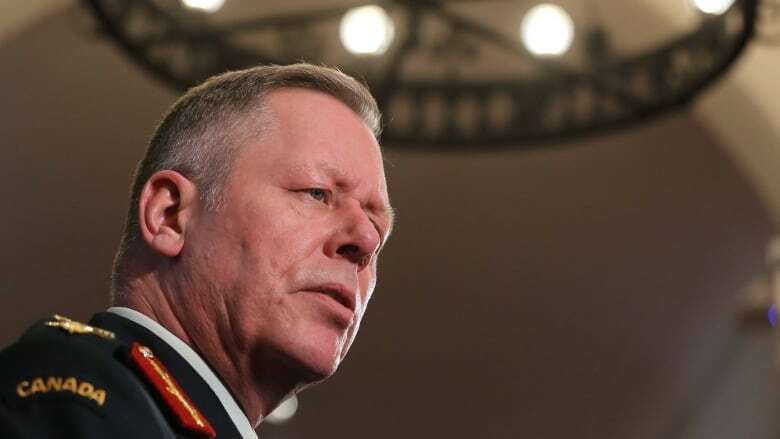 In an interview with The Canadian Press, Vance said he wants to show members of the LGBTQ community already serving in the uniform that he and the rest of the top brass support them. But the defence chief is also hoping his participation will spur other members of the community to think about a possible career in the Armed Forces by demonstrating its openness to all. "We want to recruit people from as diverse a segment of society as we can," he said. "And that includes those LGBTQ folks that would be interested in the Canadian Armed Forces." Prime Minister Justin Trudeau is also scheduled to march in the Ottawa parade, but Vance insisted he was marching to strengthen the military and not because of any political agenda. "It's not a political act, it's a leadership act. I'm not doing this to ride any coattails," Vance said. "I'm doing this to speak to the Armed Forces. I want them to know their chief of defence staff supports them, that broad LGBTQ community, and those of you who are out there thinking about joining." The Canadian military's history when it comes to LGBTQ issues is checkered, starting with the forced resignation of some service members because of their sexual orientation in the 1960s, '70s, and '80s. Things began to change in 1992, when a high-profile case forced the military to lift its ban on members of the LGBT community serving in uniform. But it has been only recently that the Forces forces under Vance have made a concerted effort to reach out to the community — a move that coincides with the military's need for thousands of recruits. It has also been working to entice more women, visible minorities and Indigenous people to join. "We have an Armed Forces that has the operational need to be able to choose its recruits from the widest possible segment of Canadian society," he said. "And any segment that's left out, whether you're a new Canadian, LGBTQ, Indigenous, if they are left out in any way, then it is a loss to us." Vance recently issued a directive encouraging military personnel to attend Pride events in uniform, but he said "it's about time" that he started leading by example. "This is one act, one effort on my part, to speak with action," he said. "Actions speak louder than words to Canadians about the sincerity of our position that the Armed Forces are on the move." U.S. President Donald Trump touched off a storm of dismay and anger last month when he announced on Twitter that he would reinstate a ban on transgender personnel in the American military. Trump said one of his reasons for the ban was the "disruption that transgender in the military would entail." While Vance did not want to talk about Trump's comments, he did say that accepting transgender personnel had no negative impact on the Canadian military's ability to do its job. "Those people are valuable and they've got a job to do and we're helping them do their job," he said. "And I have never seen where the necessary adjustments to infrastructure or what have you have had an impact on operational capability."